From the album EARS out April 1st on Western Vinyl Order EARS iTunes: http://hyperurl.co/gz5pqt Bandcamp: http://hyperurl.co/vo3n6n Amazon: http://hyperurl.co/qypau1 WV: http://westernvinyl.com/shop/wv145 Artist Page http://westernvinyl.com/artists/kaitlyn-aurelia-smith Website http://kaitlynaureliasmith.com/ Facebook https://www.facebook.com/kaitlynaurelia/ Twitter https://twitter.com/kaitlynaurelia Instagram https://www.instagram.com/kaitlynaurelia/ TOUR DATES March 18 - London - Convergence Festival March 22 - Dublin - Button Factory w/ Battles March 24 - London - Electric Brixton w/ Battles March 25 - Paris - La Cigale w/ Battles March 26 - Reims - La Cartonnerie w/ Battles March 27 - Brussels - BRDCST Festival March 29 - Milan - Magazzini Generali w/ Battles March 30 - Rome - Spring Attitude Festival w/ Battles March 31 - Roncade - New Age Roncade w/ Battles April 01 - The Hague - Rewire Festival April 05 - Lausanne - Les Docks w/ Battles April 06 - Zurich - Rote Fabrik w/ Battles April 07 - Berlin - Kantine am Berghain April 12 - Belgrade - Resonate Festival April 13 - Berlin - Ableton User Group Meeting April 15 - Linz - Stadtwerkstatt / Kirchengasse 7 April 28 - Fayetteville, AR - George’s Majestic Lounge w/ Animal Collective April 29 - Austin, TX - Levitation May 01 - Tulsa, OK - Cains Ballroom w/ Animal Collective May 03 - St. Louis, MO - Pageant - St Louis, MO w/ Animal Collective May 04 - Royal Oak, MI - Royal Oak Music Theatre w/ Animal Collective May 06 - Nashville, TN - Marathon Music Works w/ Animal Collective May 07 - Atlanta, GA - Buckhead Theatre w/ Animal Collective May 08 - Asheville, NC - Orange Peel w/ Animal Collective May 10 - Washington, DC - 9:30 Club w/ Animal Collective May 13 - Wilmington, DE - World Café Live at The Queen w/ Animal Collective May 14 - Sayreville, NJ - Starland Ballroom - w/ Animal Collective Listeners familiar with Kaitlyn Aurelia Smith's previous album Euclid (an album that prompted Dazed to call her "…one of the most pioneering musicians in the world.") will no doubt notice her heavier use of vocals on her new album EARS. On all but one song, her gently ecstatic swells of vocals emerge to soar over a dense jungle of synths and woodwinds. After initially composing on a Buchla analog synth, she wrote arrangements for a woodwind quintet, added vocals, and further refined the pieces with granular synthesis techniques she developed in her sound design work (she contributed sound design to Panda Bear's "Boys Latin" video, and handled sound design and original compositions for Brasilia co-written by and starring Reggie Watts). Kinetic arpeggios of synths pulse, often buoying her graceful vocal mantras, while woodwinds breathe and flutter, emulating the wildlife Smith observed while growing up on the West Coast (she even studied recordings of slowed down bird calls prior to composing these pieces). Though some of her gestures echo the musical tropes used by early minimalist composers, the world she creates on EARS is uniquely hypnotic and full of life, not unlike Miyzaki's film Nausicaä, which she cites as an inspiration. This is really quite magical. What a discovery! Gorgeous. Hearing this.. and learning that Kaitlyn was inspired by Nausicaä is enough for me. welcome back. we've missed you! 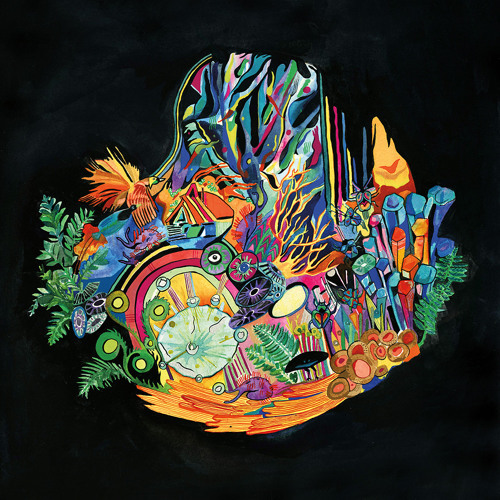 Buy Kaitlyn Aurelia Smith - "Arthropoda"
Users who like Kaitlyn Aurelia Smith - "Arthropoda"
Users who reposted Kaitlyn Aurelia Smith - "Arthropoda"
Playlists containing Kaitlyn Aurelia Smith - "Arthropoda"
More tracks like Kaitlyn Aurelia Smith - "Arthropoda"